What is your process of making sculpture? 3. 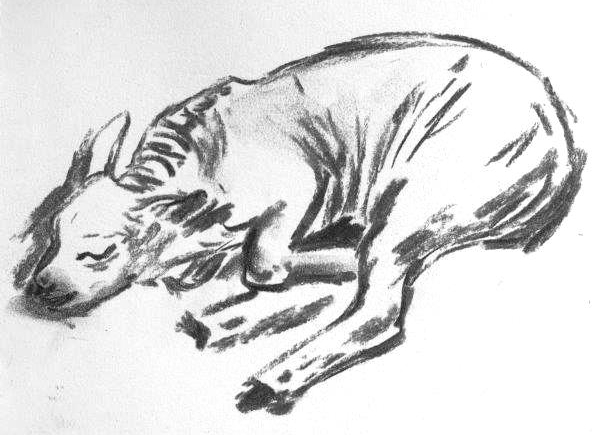 Then it is necessary to make a whole lot more drawings, preferably from observing the creature (or human), occasionally from a photograph (if the animal is too wild or the pose too dynamic); nearly always in charcoal. This way it feels as though I draw my way into a subject and I begin to feel my way around its form. The drawings go up on to the studio wall to support me when I am making. Sometimes quite intuitive charcoal marks suggest a texture later on. 4. I create 1-3 small maquettes working in wax, clay or paper; this is when I first start to explore the form three dimensionally. 5. Next is the armature (a usually welded steel support for the clay); if the piece is not too big or heavy I prefer using thick square-section aluminum rods for the legs as this material allows me to make changes later on (and in my experience the armature is always in the wrong place; I always battle with it!). 6. The creation of the ”original” starts with big slabs and large chunks of clay, always as-it-were “drawing” the skeletal structure to start with, to which I add layers of textured slabs. I work quite intuitively, sometimes throwing a thin slab of clay onto the previous layer delighting in the way it ripples and hugs the form underneath. I work steadily with always my eye on what is happening and how the clay is behaving in its unique clay-way. It is important to allow accidents to happen, to be surprised and not to be too controlling. To not over-work the piece and to allow it to be arresting and raw. Mind you, most of the time I am urged on through an awareness of the faults of the piece. Working on a large turntable allows me to consider it constantly from all angles. 7. A mould is made either at the foundry or by an independent mould maker. The trick is knowing where to put the seams, which is created by means of a clay wall. The first layer is made from silicone rubber, which is further supported by the “jacket” which is made from plaster of Paris or resin with fibreglass. The simplest mould is in two halves around a leg, head or tail. Most sculptures have moulds consisting of many parts..
8. A resin cast is made straight into the mould. The first layer can contain powdered material such as coal dust, iron, stone-dust or bronze. 9. For bronze casting see below. How do you achieve the different surface textures? The clay is either imprinted with items such as corrugated card, netting or various fabrics – using a rolling pin for even distribution - or thrown into a series of moulds to recreate the texture “in the positive” (such as various ropes, a basket, a tire, embossed wallpaper or bits of machinery). It is a bit like making a texture-collage. How long does it take you to make a sculpture? Of course there is no sculpture without preparation such as drawing and finding visual information such as the skeleton of a creature. After that it all depends on the size. A maquette (small hand-held sculpture) can take one to four hours to create in wax or clay (the casting can take several days); a life-size cat or dog, 3-5 days (not counting the time it may take to create the metal armature or structure to support the clay) and a monumental piece several months. The casting process is what takes far more time or man-hours than the creation of the original piece. If it took days to create the piece in clay, it will take weeks to get through the casting process. What is the process of “lost wax” bronze casting? The casting procedure is called the lost-wax process because it requires creating an exact replica of the original sculpture in wax. This pattern in then encased in a ceramic mould and heated in a kiln to burn away the wax leaving a cavity to fill with molten metal. This mould is then broken off to reveal the casting. Lost-wax is perfect for casting sculpture because any shape can be cast and fantastic “finger print” surface detail from the original sculpture is reproduced. How long does the bronze casting process take? It takes generally 6-8 weeks, depending on the foundry work-load. Is there an alternative to “lost wax” casting? There is. 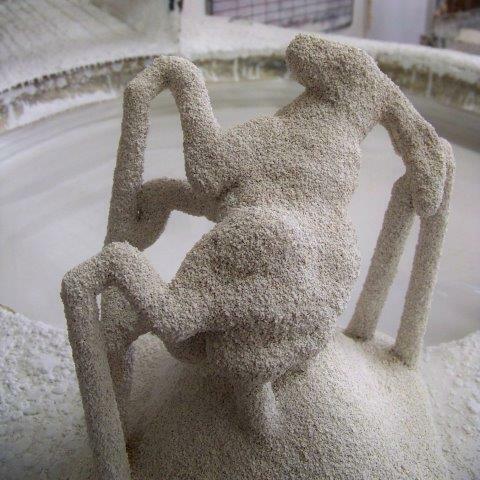 A quicker and simpler form of casting is in moulds made of sand! All you need is a hard “original” or “pattern” to push into the sand to shape the mould. This only works if you can remove the original without disturbing the sand, which means that no “undercuts” are allowed. As forms are cast solid, this method is only suitable for relatively small pieces. I have created a few simple ceramic forms especially for this type of casting such as the small “Skriker” - which is essentially a relief - and a tiny flattened bust called “Lucky”. As this type of casting is less specialised I can have it done quite locally. Can a bronze sculpture be left outside throughout the year? Yes, it is superbly suited to endure all weathers. It can be fixed securely on to a plinth using epoxy resin, or into the ground using concrete and stainless steel fixings. Can a ceramic sculpture be left outside in winter? My sculptures are generally not fired to stoneware temperatures, which mean that there is a risk of frost damage. How can my sculpture be secured outside? It can be fixed securely on to a plinth using epoxy resin, or into the ground using cement and stainless steel fixings. I am happy to advise you on the best way to fix your piece in place. Is resin a suitable alternative to bronze? 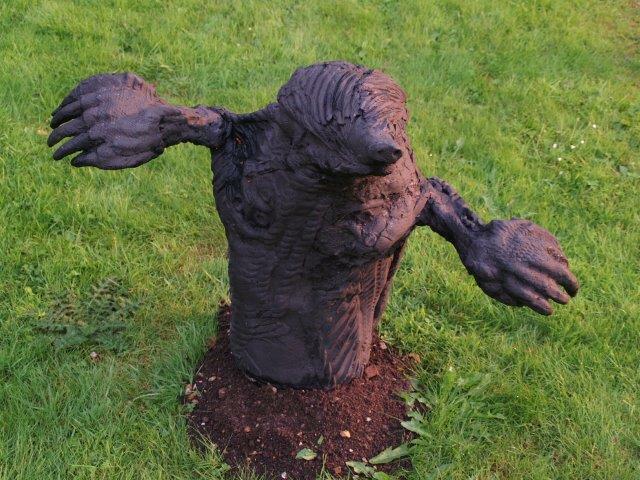 I have kept several resin sculptures in my garden for many years now. I do not worry about theft – as I would with a bronze piece (unless it is secured) - and so I can move it around easily if I want to mow the lawn or just fancy trying it in a different location. Added is the joy of the lightness of the material. Resin is not as strong as bronze, and so over many years there will be some wear, but this is imperceptible. If it were to suffer too hard a knock, it can be repaired easily. It is also considerably cheaper. Please inquire about the price of a resin cast, where I have quoted for a bronze cast only. Some small bronzes appear to be unique. How is that? As medium and large bronzes are cast hollow, there is always a need for a rubber mould, into which the molten wax is “painted up “, forming a thin layer. Only the smallest bronzes are suitable for casting into solid bronze. Sometimes I create a small one-off sculpture in wax, which can be dipped into clay slip to form the ceramic shell without the need for a rubber mould. It is a little risky: if the cast does not work out (if the bronze has not reached all parts of the ceramic shell mould) the sculpture is lost and I have to start again. Are any sculptures immediately available? Yes, I have some pieces in storage which I can arrange to have transported at short notice. Let me know which piece you are interested in and I will check on its availability. If the piece you would like to buy is not immediately available I will order a new cast from the foundry; it can take up to two months for the sculpture to be cast and delivered to you. How should I look after my bronze sculpture? If it is kept indoors there is very little you need to do. You can dust it occasionally or wash it with a mild detergent. Most sculptures are finished with a light wax polish. If the sculpture is kept out of doors I advise that you should apply a thin coating of wax polish once a year: this will preserve the patina. I use a neutral (uncoloured) Black Bison wax polish, which I apply by brush. A permanently outdoor piece will tend to slowly darken over time. A light tinted sculpture can be re-patinated in due course. Is the sculpture/drawing signed by the artist? A detail of the Owl of Few Words; the squiggly MW signature on the right is followed by the edition number. What is an artist’s proof? When casting from a mould the artist can make one or two “artist’s proofs” on top of the limited edition number. The idea is that she can try out and vary the exact assemblage of the parts or try out different patina’s. When a mould is made for casting there is really no reason not to cast several sculptures from it. I decide on the number (currently usually 9 for medium and large pieces, and 25 for small pieces) and mark each piece in the wax when I prepare it for casting. In this way the first piece is marked 1/9, the second piece 2/9 and so on. After the casting of the last piece in the edition is completed the mould is destroyed. What is a patina? How do you colour bronze? The patina is a thin layer that variously forms on the surface of copper or bronze produced by oxidation or other chemical processes. If left untreated bronze will naturally become dark brown with light green in certain areas - as you find on bronze statues. When is has just been cast and had the ceramic shell mould sandblasted from it, it has a matt beige hue. I can speed up the oxidisation process by heating the bronze with a blow-torch and introducing a thin coating of a chemical solution. Potassium Sulphate will darken it, while Copper Nitrate makes it light blue-green and Ferric Nitrate creates a deep red hue. You can discuss the colour/finish options with me when you order a sculpture that is yet to be cast. Is it possible to have a bronze cast of a ceramic sculpture? Yes, if I had unlimited funds I would cast all my ceramic sculptures in bronze, as ceramic is so fragile compared to a robust bronze cast. Added to that is the fact that on the whole wet clay translates better into bronze than into its ceramic state. Will I get a certificate of authenticity with the sculpture when I buy one? Yes. You will have a certificate signed by me with details of the foundry where it was cast.